This Research Snapshot focuses on carers' reports on training they had received and the degree of contact with their caseworker.1 The first Research Snapshot shows that many children in out-of-home-care have previously experienced abuse or neglect or been exposed to family violence or other problems at home, which has had serious negative effects on their wellbeing. Indeed, according to carers' reports, one-third of carers reported that the study child had at least one type of developmental condition. Providing carers with training courses or workshops can provide them with support and skills to deal with children's difficult behaviours and better cope with caring demands. Nearly two-thirds of carers (62%) had attended some form of training course or workshop to assist them in their caring role in the past, and 40% had done so in the last 12 months. Foster carers were more likely than relative/kinship carers to have undertaken training for their caring role (both in the past or in the last 12 months). Carers who undertook a training course or workshop in the last 12 months were positive overall about the training received, with the majority having found it to be very helpful. Caseworkers are an important source of support for carers and the majority of carers had contact with their caseworkers at least monthly, with four in ten at least fortnightly. Carers who were in contact with a caseworker were satisfied with the advice or assistance they received in their most recent contact, with four in ten reporting "very satisfied" and another three in ten reporting "satisfied". Carers were asked a series of questions about whether they had ever attended a training course to assist them in their role as a foster or relative/kinship carer, and whether they had done so in the past 12 months. Close to two-thirds of carers (62%) reported having ever attended some form of training course or workshop to assist them in their caring role in the past, and 40% of carers reported having undertaken training in the last 12 months. just over half (54%) of foster carers indicated they had received training in the last 12 months, compared to only 16% of relative/kinship carers. Based on the responses of carers who had undertaken training in the last 12 months, attending training through an out-of-home-care agency was the most common (60%), followed by attending training via a jurisdictional child protection department (23%) and through a carer support group (16%). Carers who had participated in a training course or workshop over the past 12 months were asked how helpful they had found it. The majority of carers found it very helpful (59%), and 31% said that the training was "fairly helpful". Foster and relative/kinship carers had relatively similar views about the helpfulness of the training received, (although a much lower proportion of relative/kinship carers than foster carers had undertaken training in the past year). forty-two per cent thought it would not have been helpful at all. Foster carers who had not undertaken any training were more likely than relative/kinship carers to believe that doing so would have been very or fairly helpful (57% vs 38%). What training do carers say they want? A selected sample (n = 39) of carers who said that receiving training would have been very or fairly helpful were asked to specify what types of training courses/workshops would have been helpful to support them as carers. The most common type of training identified was training that helped carers to deal with the emotional and behavioural issues experienced by children living in out-of-home care, including those that were a result of trauma experienced by the child. Caseworkers (also known as carer support workers) are an important source of support for carers. Caseworkers can provide direct support as well as information/services referral. Table 1 summarises carers' reports regarding how often they had contact (face-to-face, phone calls, emails, etc.) with a caseworker or carer support worker about the study child. 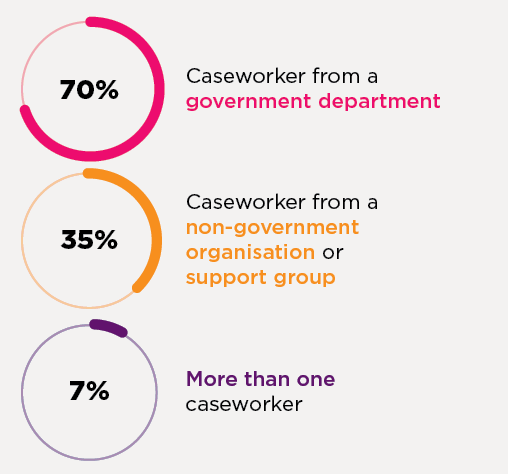 Around one in five (21%) reported seeing their caseworker weekly, while a similar proportion (19%) reported seeing their caseworker only 1-4 times per year. The most common response provided by carers (at 31%), however, was monthly caseworker contact. There were considerable differences between foster and relative/kinship carers, with foster carers being much more likely than relative/kinship carers to have weekly contact. Notes: Percentages are based on weighted data. The sum of responses may exceed 100% due to rounding. Excludes carers with a response of "don't know". Carers who were in contact with a caseworker most commonly indicated that he/she was from a government department (70%), with just over one-third (35%) indicating that their caseworker was from a non-government organisation or support group. A minority (7%) of carers had contact with more than one caseworker. Carers who were in contact with a caseworker were also asked about how satisfied they were with the advice or assistance they received in their most recent contact. Overall, three-quarters of carers were either "very satisfied" (41%) or "satisfied" (34%) with their most recent caseworker contact. Only 14% were very "dissatisfied"/"very dissatisfied" (the remaining 11% were neither satisfied nor dissatisfied). Although a positive picture prevailed for both foster and relative/kinship carers, foster carers were slightly more positive in their reports of satisfaction with the advice or assistance received. The common themes include a lack of understanding and/or professionalism from their caseworker, communication difficulties (e.g., phone calls not being returned, no reply to emails) and a lack of accountability and responsiveness. Qu, L., Lahausse, J. & Carson, R. (2018). Working Together to Care for Kids: A survey of foster and relative/kinship carers. (Research Report). Melbourne: Australian Institute of Family Studies.